WITH wife Natalie by his side, Barnaby Joyce will take a deep breath today and leap off the political cliff that is their New England. It will complete his audacious journey from outsider to contender for the leadership of the Nationals and the second-most powerful job in the land. Barring an upset of epic proportions, the man who made his name by crossing the floor of the Senate* to vote with his conscience, who swore that the trappings of high office would never be for him, will be preselected to run for the lower house of parliament, in a new state, against the MP who was instrumental in forging the “new paradigm” of minority government with the Labor Party. 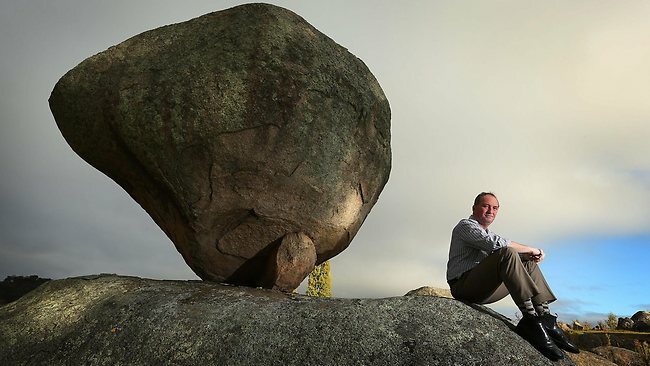 This is all or bust for Senator Joyce, 45, the opposition spokesman on regional development, local government and water, and leader of the Nationals in the Senate. Assuming he is preselected, he will resign from the Senate by the time writs are issued for the September 14 election, midway through his six-year term. If he goes on to win the seat of New England for the Nationals, and the Coalition comes up trumps in the general poll, Barnaby Joyce MP will be a mover and shaker in Tony Abbott’s new government, a leader in waiting for his party and potential deputy prime minister. Yes, it’s a lot to get the head around. But so is the progress of the once-maverick Senator Joyce, as his life and career turn full circle to where it all began for him, on the northern tablelands of NSW. He was born in New England, was schooled there, played rugby for the district and wooed his wife, believing that his future lay in farming the land, not running the country. It’s the place he left in 1994 to start over in Queensland after his parents demanded that he make the impossible choice between them and the woman he loved. And it’s where his anticipated struggle with the powerfully entrenched independent Tony Windsor, buttressed by what should be an impregnable margin of 21 per cent, will be one of the most keenly watched match-ups when Australians go to the polls next spring. “This is where I’m from,” Senator Joyce says, as he noses through the evening traffic in Tamworth in his dusty Land Cruiser, with Natalie and their 13-year-old daughter, Caroline, in the back fiddling with an iPod. If he is labouring the point, it is because it’s sensitive. The battle lines have already been drawn in his anticipated head-to-head against Mr Windsor, with the four-term federal MP branding the Nationals man as “second-choice Joyce”, a dig at his past interest in the bush seat of Maranoa in southwest Queensland, as well as the sacking by the Nationals of their original candidate for New England, Richard Torbay. Senator Joyce is acutely aware that his local connections are under scrutiny. But if Mr Windsor was trying to suggest he was some sort of “blow-in”, then, Senator Joyce retorted, he had better explain why he “sold out” his conservative-leaning electorate and backed Julia Gillard to retain power after the inconclusive 2010 election. “I’m not saying it’s going to be a walk in the park – I’m not naive,” Senator Joyce said of the challenge of winning back what was once a crown jewel for the Nationals. “This is going to be incredibly hard and I think if Tony hadn’t supported … the Green-Labor Party-independents alliance then it would be a suicide mission. Despite a personal approach from The Weekend Australian and follow-up calls to his office, Mr Windsor did not make himself available to be interviewed. He crossed paths fleetingly with Senator Joyce on Wednesday, in full campaign mode, at a regional development forum in Armidale. They shook hands and exchanged a brief, seemingly cordial word. First order of business for Senator Joyce is today’s preselection at West Tamworth Leagues Club, in the heart of the state seat Mr Windsor represented before jumping to federal parliament in 2001 at the expense of the Nationals. Up to 150 branch members are expected to vote. The only other candidate, software entrepreneur David Gregory, 34, said he would like to think the result would be close “but, seriously, I’ve got no idea what the numbers are”. The circumstances in which he and Natalie left New England all those years ago are a poignant but little-known counterpoint to the high-stakes politics. The couple met at university in Armidale, the other population centre in the electorate. She was studying arts while up-for-a-beer Joycie fitted his accountancy course around rugby commitments. First impressions didn’t work for her. When he asked her out by the fountain outside the Armidale Ex-Services Club, where they pitched up together on Wednesday, she thought she would give him a chance. “I’ve been following him around for years and there is no point stopping now,” Natalie, now 43, explained. Her family lived near the town of Manilla, north of Tamworth. Young Barnaby hailed from Danglemah, on the range east of the town. For him, university was a “last hurrah” before he settled down to working full-time on his parents’ property. When they realised that marriage was on the cards, they gave him an ultimatum: it was the farm or Natalie. It didn’t take him long to make the decision, estranging him from his parents. In 1994, he landed a job with the then Queensland Industry Development Corporation to run its branch in St George, which became the couple’s new home, 550km west of Brisbane. Defeating Mr Windsor – assuming he recontests the seat, which, as local journalists point out, he is yet to confirm – will be the biggest challenge of Senator Joyce’s career. In 2010, Mr Windsor increased his base vote by five percentage points, gaining 62 per cent of the primary count and an astonishing 71.5 per cent after preferences. But his unwavering support for the Prime Minister has hit his local standing. An automated poll by ReachTEL last August had Mr Windsor badly trailing Mr Torbay, the former state independent MP and mayor of Armidale, who is now under investigation by the NSW Independent Commission Against Corruption, amid reports that he accepted $50,000 from the Obeid family, a claim this week rejected by patriarch and former Labor powerbroker Eddie Obeid. Internal polling conducted by the Nationals before Mr Torbay’s stunning exit last month also put him ahead of Mr Windsor, but by a margin of less than five points, The Weekend Australian understands. Armidale Mayor Jim Maher, a former lecturer in politics at the University of New England, believes the uproar over Mr Torbay will favour Mr Windsor. Dr Maher tipped Mr Windsor to take the seat in 2001, and believes he will hold out against Senator Joyce’s star power. The non-aligned Mayor of Tamworth, Col Murray, agrees. Senator Joyce accepts that he is taking a heavy risk in taking on Mr Windsor, 62. There is no plan B if he loses; the Queensland Liberal National Party would have already filled the casual Senate vacancy, and there was no question that he could or would be reinstated. “I think I will be in a world of trouble if I don’t get up here,” Senator Joyce said. Typically, he professed to have no second thoughts about the move. Staying in the Senate was not an option. “One would presume on the current polling that the Coalition will win the election, in which case I can see very quickly that if I stayed in the Senate I would get pushed into a position where I have … to cross the floor, because that’s what a senator’s supposed to do,” he said. If he does win New England, restoring to the Nationals a seat that was held by one-time party leader and Fraser government minister Ian Sinclair for 35 years, Senator Joyce has pledged he will never challenge his leader, Warren Truss, despite Mr Truss’s relatively low public profile. “I’ve had these discussions with Warren and what I’ve said to Warren, I’ll say to you: as long as he is there, I will back him,” Senator Joyce said. He would not be drawn on speculation that Mr Truss, 64, would be prepared to stand aside for him after a term as deputy prime minister if the Coalition won the election. For my part, the Big Question is this. Has nearly eight years spent swimming in the steaming, fetid cesspool of Australian politics seared Barnaby’s conscience … or will he again vote according to the supreme sovereignty of Conscience, in the CFZ of the lower house of Parliament? * Barnaby crossed the floor 19 times from July 2005 through to the end of the Howard government era in 2007. Senator Joyce acknowledged running for New England would be a risk for his political career. “Why do I take a risk of my career in New England?” Senator Joyce said. “Because we’ve got to do something about this. Greg Combet has said today on ABC AM that the carbon tax will bring about innovation. I agree. It will be about innovation. Now that power is so much dearer, how do I stay warm? Likewise, now that power is so much dearer, and it’s summer, how do I stay cool? Now that they are shutting down a major power supply, how do we maintain affordable base rate power? Now that our competitors don’t have a carbon tax and we do, what are we going to discount so that we can sell the product? Or do we just shut down the product? Now that the government has a tax that they can put up whenever they like, do I trust them to not put it up whenever they like? Now that the government is $197.1 billion gross in debt, borrowing an extra $3 billion just last week, do I think that in due course they will just use this revenue stream as a desperate attempt to pay back people overseas? This is all innovation and much more that we can expect from Labor’s carbon tax. If one Labor lower house member, such as Sharon Bird, Stephen Jones, Kirsten Livermore, Joel Fitzgibbon or Yvette D’Ath crosses the floor the carbon tax will not come in. Now that is truly simple innovation that could really get rid of this tax. Are you sick of it yet? It’s only just started. The carbon tax legislation has not even been introduced. Why does it have so much resonance? Why has it managed to do something that so many issues don’t manage to do? That is, that cherished political attribute where the vast majority have an opinion on it and are not afraid to express it. They either love it or they hate it. Politics at times can be a peculiar art form. As I have said it’s thixotropic. You believe something is solid until it is shaken up and dissipates through your hands leaving the policy gel to drip between your fingers. It has The Bad Touch, as the Bloodhound Gang would say, yes it’s getting two thumbs up. Here is the crux of the issue: if only one of the expected supporters in the lower house changes their vote, the carbon tax doesn’t get up, the battleship will be sunk. The Labor Party spent years telling me how to vote on issues when they thought my vote would be crucial and to be fair I crossed the floor 28 times. I know for an absolute fact, having just returned from the Hunter Valley, that there are at least three Labor members there who are not representing the views of their constituents. Sharon Grierson in Newcastle, Joel Fitzgibbon in Hunter, and Greg Combet in Charlton are in seats that do not want a carbon tax. It is not sort of ”don’t want it”, we are talking ”red-hot rejection”. So if they are people of honour, who put their electorate first and foremost, who are strong enough to suffer the slings and arrows of outrageous fortune and take arms against a sea of troubles, they should stop this tax. The torture of Hamlet I have been there, ably counselled by Labor Party promoters and their agents. Sometimes they were dead right. If I was in a coal seat, knowing that a policy had been co-written by a person who has said quite adamantly the coal industry should be closed down, and I was elected on a promise not to introduce a carbon tax, I think the only honourable thing would be to oppose a carbon tax. This same policy is also just going to put up the price of power on top of the 50 per cent that electricity prices have increased in the past three years. The end result of this is that the temperature of the globe doesn’t change, our domestic emissions go up, according to the Treasury modelling, and we send more than $3billion a year overseas to buy carbon credits abroad. It is tough to cross the floor against your party but why else are you in politics but to represent the views of your electorate? Take it from me, you get used to having dinner on your own and your mates in Canberra will get over it eventually. See it is not just Julia Gillard that has failed to tell the truth on this one, it is everyone who was the benefactor of that promise given. Every Labor member that was elected at the last election did so on a platform against a carbon tax. It is quite obviously a major promise that they should honour and do everything in their power to honour that promise in how they act. When you don’t honour your promises it doesn’t just make a fool of you, and the Prime Minister in this case, it makes a fool of everybody because the people in your electorate know that what you say is meaningless. In Canberra, Andrew Leigh, Gai Brodtmann and Senator Lundy all won their seats with a policy commitment that they would not introduce a carbon tax. Not one of them said I am putting a caveat on that because I might introduce a carbon tax. Each one of them is as responsible for their actions as Gillard. What is the purpose of listening to an election speech if it is completely and utterly without honour? How are you going to hold the other side to account when you let your own side deceive? You don’t have to believe in the philosophy of the commitment but you should believe in the principle that a person should honour the key commitments they make when they are endorsed by the electorate. That is the essence of what a democracy is about.